The aorta terminates at the fourth vertebra of the lumbar spine. Over there it splits within the right as well as left common iliac arteries. These two particular arteries travel down as well as to every side of the body for approximately five centimeters to the edges of the pelvis. Then each of them once again divides into internal and external iliac arteries at the pelvic inlet, the area where the abdomen ends and the pelvis starts. The common iliac artery is a combined structure, implying there is one on the right as well as one left wing of the body. The common iliac arteries enter into the pelvis on the medial side of the psoas muscle. 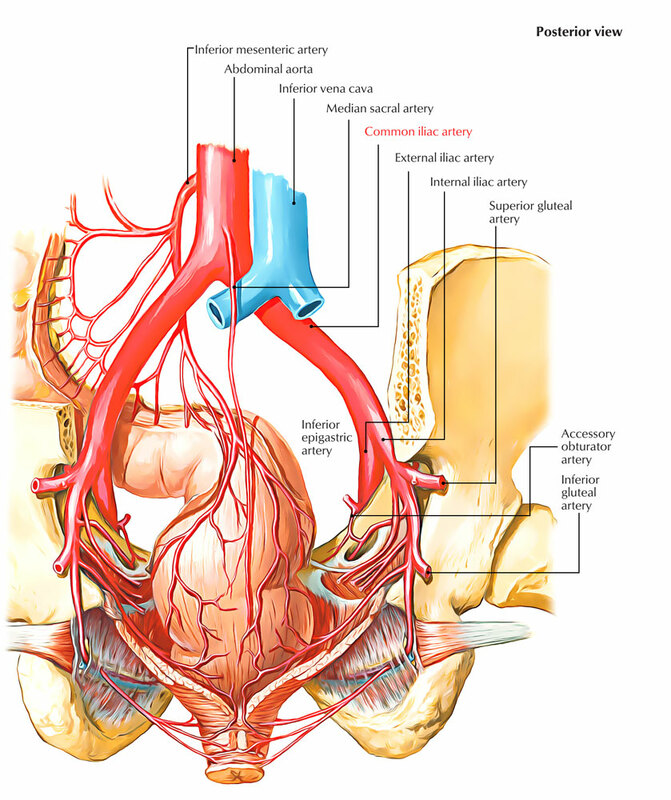 The left common iliac artery is smaller than the right. The right common iliac artery enter before the left common iliac vein and after that anterior and alongside the right common iliac vein. The left common iliac artery route is easier, passing alongside as well as lateral to the left common iliac vein. The common iliac artery bifurcates at the point where the ureter goes across it before within its terminal sections, internal iliac artery as well as external iliac artery, at the level of the pelvic brim, before the sacroiliac joint. In addition to the terminal branches, the common iliac arteries also distribute branches to the neighboring tissues, peritoneum, psoas muscle, ureter as well as nerves. Occasional branches are the iliolumbar and accessory renal arteries.